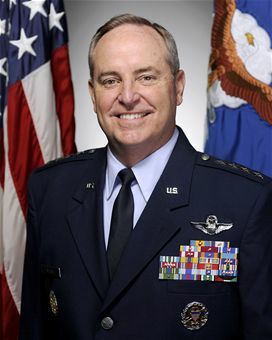 Air Force Chief of Staff Gen. Mark Welsh will be the featured speaker for an upcoming Air Force Association breakfast on June 17 from 7 a.m. to 9 a.m. at the Key Bridge Marriott in Arlington, Va. The AFA Air Force breakfast program features many of the Air Force’s top movers and shakers as guest speakers and attracts members of the military, the defense and aerospace industry and the press. Past speakers at the annual 10-month series include Secretary of the Air Force Michael B. Donley; former Chief of Staff of the Air Force Gen. Norton A. Schwartz; Dr. Jamie M. Morin, assistant secretary of the Air Force for financial management and comptroller; and Dr. Mark T. Maybury, chief scientist of the Air Force. AFA is a non-profit, professional military and aerospace education association that counts as its mission promoting the Air Force, national defense and honoring airmen. Register online at http://june2013bkft.eventbrite.com/. For additional information, contact Sarah Piggott at spiggott@afa.org. The Key Bridge Marriott is located at 1401 Lee Highway Arlington, Virginia 22201.